Updated home in Sunrise on English Hill. The spacious floorplan boasts 2194 s.f. and features 4 bedrooms, 2.75 baths on a private cul-de-sac lot! Many recent updates include – remodeled kitchen, baths & new windows! Sunken living room with vaulted ceiling & wood burning fireplace. Spacious dining room. Updated kitchen with island features white cabinets, granite counters, newer appliances, bamboo floors, pantry and slider to deck & yard. Wonderful master suite with vaulted ceiling. The attached updated bath has granite counters, new fixtures and a double shower too! Two additional bedrooms are also spacious. The main bath has been updated with granite counters & new fixtures. On the lower level you’ll find heated tile floors. The 4th bedroom is oversized with a wood stove and a slider to the rear yard. The full bath has been totally remodeled with new jetted tub, tile shower, heated tile floor, towel warmer & new fixtures. Relaxing family room with built-in shelving. Cozy deck overlooks the private rear yard which is surrounded by greenery. The generous yard has play spaces, a patio and plenty of room to garden or relax! Attached two car garage. Walking distance to elementary school and neighborhood trails. Outstanding Northshore schools – Sunrise Elementary, Timbercrest Jr High & Woodinville High. I have had the distinct pleasure of buying and selling three properties with Tony Meier. He has consistently provided me with excellent service from beginning to end. Tony has a unique way of making you feel like you are his only client when you are working with him. His attention to detail, depth of market knowledge and business savvy give you the piece of mind as potential buyer/seller knowing that you are in the best of hands throughout the whole process. 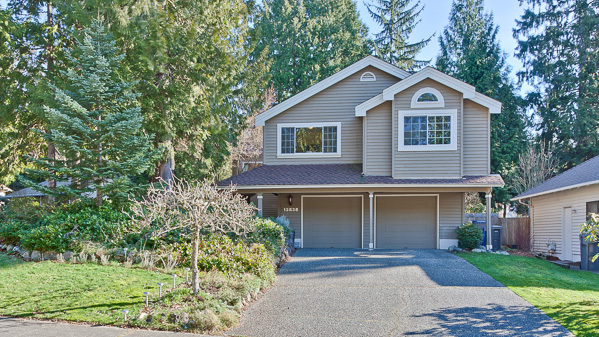 I was tickled pink at the maximized value that Tony helped me achieve on the sale of my townhouse in Woodinville. I would be happy to answer any questions you might have about what a pleasure it has been working with Tony throughout my real estate investments. Prompt sale in Sheffield above the List Price allows move to Dream Home on Golf Course in Trilogy!